Again brand new Sipelga area and I start with my favourite. Amazing view on Ehitajate way. Keskuse 14A is finally finished. The most amazing view in Mustamäe! 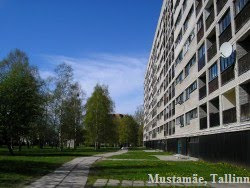 TTÜ (Tallinn Technical University, www.ttu.ee). I like this building, built in the middle of 1960's. Some patterns from the walls. They build two buildings in the same time: new library (left) and a building for economics faculty (right), still for TTÜ. This view will be gone soon. New dormitory is also under construction. That day was particularly beautiful and sunny, and spring was apparent!